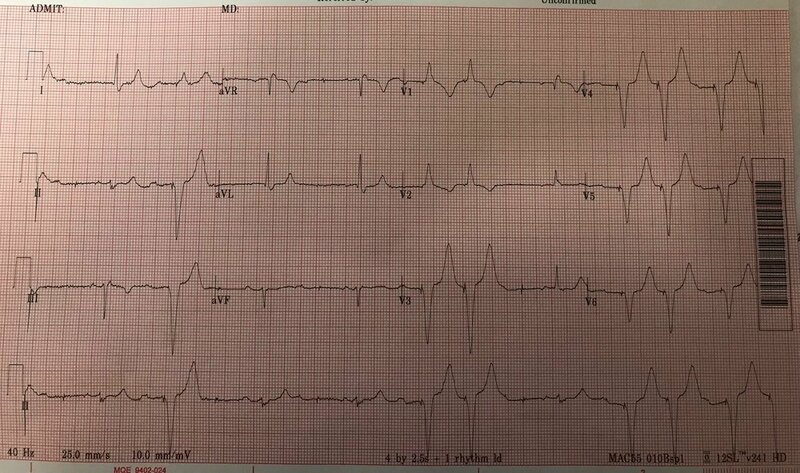 An 82 y/o female presents for syncope. While sitting at home she felt light-headed then passed out. A few minutes later she had a second syncopal episode. There was no seizure activity. She had no chest pain or shortness of breath. Past medical history: Pacemaker placed 2 weeks prior for pauses. V/S: Pulse 30, R 18, BP 110/70. She was awake and alert with a normal mental status. 1. What does the EKG demonstrate? 2. What are the possible causes of this problem? The EKG demonstrates intermittent pacemaker failure to capture. Failure to capture can be caused by lead fracture, lead displacement, electrolyte abnormalities and ischemia. The EKG shows intermittent pacemaker failure to capture. Some pacer spikes are followed by QRS complexes and some spikes are not. This is the cause of the patient’s syncope. When the pacemaker does not capture the patient reverts to her native rhythm (sinus bradycardia with pauses) and then passes out. Causes of pacemaker failure early after placement include lead fracture and lead displacement. Lead displacement is the most common cause. It is most likely to occur in the first month after placement. Lead fracture typically occurs at the site of attachment to the pulse generator or at abrupt angulations. Chest X-ray is very useful to assess for these complications (Rosen’s Emergency Medicine 7th Ed. Ch. 78). Look for fractures of the leads. Also look to make sure the lead tip is in the proper position. Comparing this X-ray to an X-ray taken after pacemaker placement will be very helpful. Blood tests can assess for electrolyte abnormalities and ischemia. Next, your EP consultant or the representative from the device company can assess the device. To determine the cause of the failure, measure the lead impedance and the threshold. The chart below is useful. Indian Pacing Electrophysiol J. 2003 Oct-Dec; 3(4): 231–238. Our patient had a very high threshold for capture. The output was increased to 8 Volts with a pause of 1 second to achieve capture. At this setting the patient remained with 100% capture. She was admitted to telemetry and EP was consulted. She was found to have dislodgement of the ventricular lead. The lead was replaced and the patient did well.